Just from the Cayirova point, we decided to go Bafra beach. You have to take right turn just after some meters. It is quite peaceful place and wow.. golden beach! , and good roads to reach the point. The village is still developing there and we see the construction of new restaurants, buildings, hotels going on. As we park our cars, we feel to be somewhere in UK. Actually we park our car near KayaArtemis Resort and Casino. Later googling, I found that, this hotel is the reconstruction of the Temple of Artemis (in Ephesus, Turkey - one of the Seven Wonders of the Ancient World) capable of over 700 rooms. In the meantime, we had some golden memories of golden beach. Everyone was running towards the sea promenade area. If we heads up, it was the clear sky, If we heads down it was the cystal clear water all around. Some of us visited inside the KayaArtemis, it was even more beautiful from inside. At some point, it feels that the whole area is floating over the sea. We taken many beautiful images here. If you want to enjoy golden beaches, prefer to stay somewhere in Famagusta and enjoy the golden beach moments. 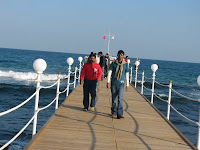 Wanna to have a look to other places in North Cyprus. Cyprus one of my favorite holiday destinations.Loved troodos mountains, paphos, and protaras. One of the best and untouched beaches in North Cyprus. no-one should miss these. Thanks for sharing this. I just just love it. Amazing.